August and September has seen me consumed by a personal crusade, which has been in the planning for some time. I have been working on an initiative designed to educate, inform and start a national dialogue in our industry about cancer. Yes, cancer. Cancer is not an easy topic to talk or write about, let alone understand. How is it a disease can become so insidious, that 1 in 3 of us will be diagnosed with some form of it during our lifetime? I have been fortunate enough not to be afflicted by the disease, but was tremendously affected by the loss of my mother to bowel cancer many years ago. It was a heartbreaking time. Of course, I am not alone in experiencing such grief. Many people I know are either currently undergoing treatment, assisting a loved one during their battle or treating patients. And whether I like it or not, many more people I know and will meet in the future will be affected. My hope in introducing an educational programme to Australia & New Zealand is to try to make a difference to, and provide an understanding and awareness of the changes to cancer patients’ skin once a diagnosis has been made. I would like to provide beauty therapists with the tools they need to ensure that when they are treating clients with cancer, they have a thorough understanding of changes the skin will undergo and ensure that they do all they can to help their clients keep the skin at its best, but also, and perhaps more importantly, help their clients relax and if only for a short time, whilst in-salon, forget about their cancer journey. Over the past few months, in the lead up to introducing the programme, I have talked to many cancer charities, support groups, hospitals, experts and friends. As a result we decided to launch the initiative with a series of workshops featuring Morag Currin. Morag is a world-renowned educator whose expertise is the discipline of oncology aesthetics. She is highly sought-after; teaching skin treatment therapists around the world to make necessary adjustments to massage techniques to those undergoing cancer treatments, what to look for, & how to treat skin for the side effects from different cancer drugs. We also heard from specialist oncology nurses who provided overviews on surgery and treatments. We met over 20 cancer patients who shared stories of their journey with passion, emotion and humour. What has become apparent to me is that these people want to talk. They want to help others to be brave through their treatment, to give hope and to reach out. But they also want to know what they can and can’t use on their own skin, and if they can or can’t go into a spa or skin clinic. So far, we have helped 40 Skin Treatment Therapists across Australia and New Zealand become certified in oncology aesthetics. 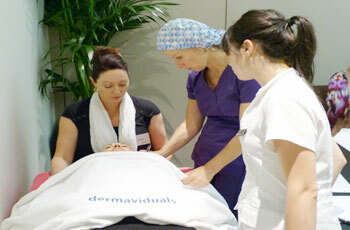 This means that these people have been trained in how to provide a safe and effective spa or skin treatment. You will find them listed on the oncology aesthetics.com website. So, it’s my firm view that the more we talk and become educated about cancer within our industry, the more we can help others. Cancer is around us, and we have to be prepared to sit down, discuss its impact openly and with compassion so we can learn to help others. It’s been a challenging yet rewarding few weeks for me. Challenging to hear the personal stories, learn about some of the horrible side effects of treatment and surgery and yet so very rewarding to know that there is something our industry can do on a practical and emotional level to help. Next week, I’ll share here some more details on the initiative and some of the techniques discussed at the workshops.